Adam Hinshelwood felt Worthing could not have done any more in their home draw with Burgess Hill on bank holiday Monday. The club’s perfect start to the Bostik League Premier Division campaign was ended as Worthing were held to a 0-0 draw by a resilient Hillians side at Woodside Road. David Ajiboye and substitute James Crane both hit the crossbar in the stalemate, while a host of other chances were missed with Worthing dominant in the second half. There was no way through, though, and Hillians came away with a point for their efforts. Hinshelwood’s troops were without a game on Saturday and had hoped to return to action with a win – to make it four victories from as many league matches. Former Brighton defender Hinshelwood felt his team dominated the second half against Burgess Hill and believes their creativity in attack will see them score plenty this season. He said: “We couldn’t have done any more than we did. A combination of bad luck in front of goal and some resilient Burgess Hill defending saw them come away with something. Worthing kept a clean sheet for a second game in succession after shutting out Burgess Hill. Defender Aarran Racine returned for the home draw with Hillians and Hinshelwood wants his experienced backline to continue to keep teams out. “Keeping clean sheets is important and it was good to keep another one against Burgess Hill. I can’t remember Lucas (Covolan) having a save to make. 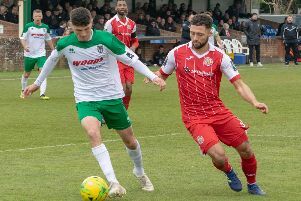 A bumper crowd of 1,180 was in attendance at Woodside Road for the bank holiday derby with Hillians and Hinshelwood hopes supporters were entertained by Worthing’s second half performance. Will Miles was missing from the matchday squad against his former team with a groin issue. But the news is more positive on long-term absentees Rhyle Ovenden and summer signing Ollie Pearce. The pair could return to the squad for Saturday’s trip to Haringey Borough. Hinshelwood said: “Will missed out against Burgess Hill with a groin problem, it’s something we’ll assess. “We’re looking to get a couple of sessions in Rhyle and Ollie, the hope is they could be ready for the game at Haringey.